The State of Democracy in Central and Eastern Europe brings together scholars specialising in the study of Central and Eastern Europe, and provides a comprehensive analysis of some of the major issues in the democratic make-up of the EU’s new member states. 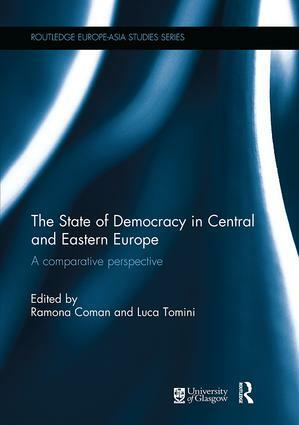 The book covers the main dimensions of the state, and contributors discuss questions about the development of democracy in Central and Eastern Europe over the past twenty years. What is the present state of democracy in Central and Eastern Europe more than twenty years since the end of communist regimes? What is the actual functioning of the political institutions of these countries? How is political participation structured, and what role do political parties play in these democracies? What guarantees are provided to limit governmental powers and abuse? What is the role of the judicial system, and the relationship between justice and politics? How can we evaluate the EU’s influence regarding democratic consolidation? What is the role of the public opinion? This book was originally published as a special issue of Europe-Asia Studies. Ramona Coman is Assitant Professor of Political Science, and Director of the Institue for European Studies, at the Universiteì libre de Bruxelles, Belgium. Her research interests relate to Europeanization, European integration and judicial reforms in the new member states of the EU. Luca Tomini is an FNRS Postdoctoral Researcher at the Université libre de Bruxelles, Belgium. His main research interests are democracy and democratization in a comparative perspective. The Routledge Europe-Asia Studies Series focuses on the history and current political, social and economic affairs of the countries of the former ‘communist bloc’ of the Soviet Union, Eastern Europe and Asia. As well as providing contemporary analyses it explores the economic, political and social transformation of these countries and the changing character of their relationships with the rest of Europe and Asia.